Shaikh’s statement is really rather incomprehensible given what he says is his starting point for analysis of the capitalist mode of production: the framework provided by classical theorists and Keynes. How can he claim to base his argument on the classical economists and Keynes when, contrary to both of those schools, he characterizes capitalism as a growing system? In Keynesian theory the system tends toward stagnation; while in classical theory, the mode of production tends toward conditions that must lead to collapse, a falling rate of profit. If capitalism is a growing system, as Shaikh asserts, how do you explain post-war Keynesian full employment policies, the object of which are precisely to ensure constant economic growth; why does the state have to constantly intervene to achieve this economic growth? With one foot in classical theory and his other foot in Keynesian theory, Shaikh’s argument is completely incoherent. He asserts the system grows, on the basis of economics tradition that the state must intervene in the mode of production to ensure growth. Marxists spend a great deal of time debating the causes and remedies of capitalist crises because they (mostly implicitly) assume growth is the normal state of the capitalist mode of production. If growth is the normal state of the capitalist mode of production, then you have to explain why it periodically deviates from growth and collapses into depressions thus requiring fascist state economic intervention. 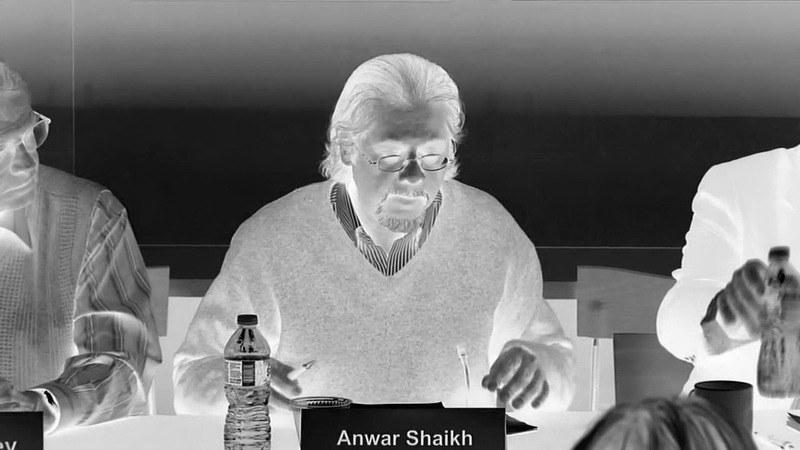 Shaikh says at the outset that he is basing his own approach in large part on that of the classical economists, including Marx, however if Marx is taken at face value, the assumption made by the classical economists, including Ricardo, was that depression, not growth, is the normal state of the capitalist mode of production. This last statement requires a brief explanation. How do we know the classical economists assumed depression, and not expansion, is the typical state in the capitalist mode of production? According to Marx, the classical economists realized early on that there was an inherent tendency toward a falling rate of profit. Although they could not properly explain this tendency, that the classical school perceived an inherent tendency for the profit rate to fall is no small matter. Profit is, obviously, the motive of all capitalist production; if the rate of profit had an inherent tendency to fall, this implied the mode of production had an inherent tendency toward conditions of production and exchange that are incompatible with the normal operation of the capitalist mode of production. Essentially, the tendency of the rate of profit to fall implies the mode of production is subject to a definite historical limit once the rate of profit finally and irreversibly reaches zero. First, the classical economists never accurately defined the distinction between constant and variable capital — a huge problem, since only variable capital produced surplus value. Second, the classical economists never accurately distinguished surplus-value from profit. Third, the classical economists never considered profit as such distinct from its distribution as industrial profit, commercial profit, interest, and ground-rent. Fourth, the classical economists never thoroughly analysed how differences in the organic composition of capital affected the formation of the general rate of profit. For all the shortcoming of the classical school in analyzing the falling rate of profit, however, they accurately perceived the tendency and, in some limited sense, realized its long term significance for the capitalist mode of production: In it was inscribed not a tendency toward growth, as Shaikh asserts, but an inherent tendency toward complete collapse of the mode of production. Moreover, according to Marx, having realized there was an inherent tendency for the rate of profit to fall, the classical economists wondered why it was taking so long for this fall to be realized. This points to an important difference in perspective between the classical economists and post-war Marxists: since the falling rate of profit produces crises and ultimately the collapse of capitalism, the classical economists assumed capitalism was inherently unstable and prone to collapse. From the perspective of classical theory, the problem was less whether capitalism had an inherent tendency to collapse, but why the rate of profit did not fall as rapidly as they assumed. Marx addresses this latter problem in chapter 14 of Capital, volume 3. In that chapter, Marx began with the assumption that the Ricardians were right about the tendency of the profit rate to fall; however, he also went on to explain how the inherent tendency toward collapse was paralyzed by what he called counteracting influences which converted the law of the falling profit rate into a tendency. Capitalism, says Marx, had an inherent tendency toward collapse, but this tendency could be offset for a time by a number of strategies to restore the profit rate in the short-term. These strategies include efforts to increase absolute and relative surplus value squeezed from the working class, driving wages below their value, reducing the value of constant capital, creation of a population of excess workers, expansion into the less developed regions of the world market, and joint-stock companies. Today, to this list we must also add fascist state intervention using the policy tools provided by Keynes. If we assume the mode of production tends toward growth, crises are an interruption of that growth and it must be explained why growth is periodically interrupted. On the other hand. if we assume the mode of production tends toward collapse, periodic crises are explained as the means to interrupt that collapse — to restore the rate of profit. Marx clearly identified with the second perspective, calling crises the means by which capitalism overcomes the falling rate of profit. “What about economic crises? Doesn’t capitalism inevitably come up against crises, crises inherent in its nature? Some people predict the collapse of the system once a week. I don’t think too much of arguments that suggest that the permanent crisis of capitalism began in the hour of its birth. But, the system does have crises—periods in which profits fall, production drops, people are unemployed. Don’t those crises demonstrate that a new system is necessary? Marx’s own argument, however, suggests this is a foolhardy strategy; capitalist crises are the means by which capital overcomes the falling rate of profit. From Marx’s perspective, we should not want capital to overcome the falling rate of profit, since the falling rate of profit drives capital to collapse. Which means, contrary to most Marxist perspectives, the last thing we should want are crises, no matter how necessary they appear for the formation of political consciousness. Rather, instead of crises that aim to raise the rate of profit, we should want to further reduce the rate of profit. The question then becomes what causes the rate of profit to fall in the first place? According to Marx, the rate of profit falls “because generally less labour is employed in proportion to the employed capital.” Which suggests that if we want to prevent capital from overcoming the falling rate of profit through crises, we have no choice but to constantly reduce the proportion of living labor in production. For capital, crises are means to overcome the falling rate of profit, but since we want to abolish capital, Marx surprising conclusion is we need the rate to keep falling, — that means not state intervention,but employing less labor in production. I have been, for a while now, debating ( in order to defend ) with so many who use Cuba and the USSR, even Venezuela, to ridicule, to discredit, and to dishonor socialism or communism. My defense and my main beef with all who do so, if my time allows me to engage them, is that neither of these countries practiced socialism as it was meant or taught. I debate with any of them by arguing that Cuba, USSR, and Venezuela distributed the best and the most to those in power and their friends, and the rest, if anything was left, among the rest of the population. That is pretty similar to what happens even in the USA. That is not the fault nor the discredit of socialism. That is the discredit of Dictators and Totalitarians who used the banner of socialism to appeal to the poor, but then betrayed them all. So I often get the counter argument that is why socialism cannot work, because it requires a totalitarian type government to impose it upon the people. Please help my correcting me or confirming my views or premises. Do you also agree with me? These countries never executed socialism, never implemented socialism ? If not, could you tell me where I am wrong? I am a hispanic who used to have family in Venezuela. In Venezuela, hardy anyone believed Chavez or Maduro implemented socialism for everyone. In Venezuela, the vast majority believes these two dictators just distributed to themselves and their friends, with the rest being thrown out to the “dogs”. My answer to such objections is that communism is free, disposable time of the worker from wage labor and nothing else.